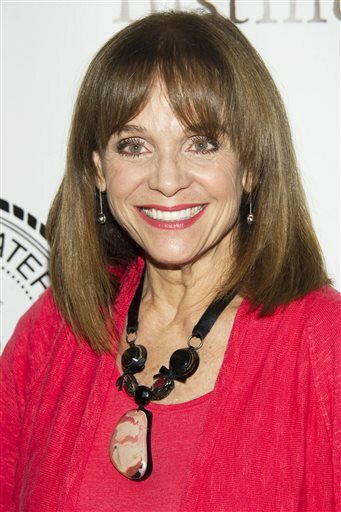 Production began this week in Vancouver on UP’s Original Movie The Town That Came A-Courtin’, starring Valerie Harper (“Mary Tyler Moore Show,” “Rhoda”), Lauren Holly (“NCIS,” “Motive”), Cameron Bancroft (“24,” “Beverly Hills: 90210”) and Lucie Guest (“Heath Nutz,” “Blackstone”). The film is produced by Odyssey Media Inc. and directed by David Winning (“XIII: The Series,” “Andromeda”). The movie is based on best-selling author and syndicated columnist Ronda Rich’s novel and loosely based on an experience she had during a book tour. Sheryl J. Anderson (“Charmed”) wrote the adapted script. The Town That Came A-Courtin’ will make its world television premiere on UP in January 2014. Abby Houston (Lauren Holly) is a smart, beautiful, successful author and fiercely independent Southern woman. When we meet her, she is curiously being kept captive in a remote cabin in the woods by an obsessed fan. Days earlier, Abby and her publicist Jamie (Lucie Guest) were visiting the lovely town of Bliss, Mississippi on her most recent book tour. The town of Bliss, local Magnolia Blossom B&B owner Charlotte (Valerie Harper) and their well-meaning prayer chain have big plans for her – as the perfect match for their widowed Mayor Spencer Alexander (Cameron Bancroft), a single dad of two. A series of collisions, several bouquets and numerous good words later, Abby relents to having dinner with Spencer, and finds a handsome, earnest man. Eagerly encouraged by the entire town, they embark on a whirlwind, public romance. But just as they are about to share a first kiss, Spencer is reminded of his late wife and abruptly pulls back. Hurt and sad, Abby is determined to leave Bliss behind, only to find her obsessed fan waiting. With phones buzzing and the town mobilized, what happens next will determine her future. UP presents an Odyssey Media Inc. production. The Town That Came A-Courtin’ stars Valerie Harper, Lauren Holly, Cameron Bancroft and Lucie Guest. Directed by David Winning. Executive produced by Kirk Shaw, Stan Spry, Rich Middlemas, Marybeth Sprows and Eric Andrews. Casting by Bim Narine. Director of Photography is Curtis Petersen. Editor is Sabrina Pitre. Composer is Michael Thomas. Adapted screenplay by Sheryl J. Anderson. UP, (www.UPtv.com) based in Atlanta, is America’s favorite network for uplifting family entertainment. The network presents original and acquired movies, series, stage plays and music specials along with gMovies, the first faith-friendly streaming movie service. The UP brand is reflected in “Uplift Someone,” the network’s successful pro-social initiative. UP can be seen in more than 61 million homes on major cable systems including Comcast, Time Warner Cable, Cox Communications and Charter Communications, as well as DIRECTV on channel 338, DISH Network on channel 188, and Verizon FiOS on channel 224. Follow UP on Facebook & Twitter http://facebook.com/UPtv & @UPtv. With its head office in Vancouver BC and branch offices in Brisbane, Australia and Los Angeles, California, Odyssey Media Inc. is a leading international entertainment company specializing in film and television production, financing and packaging. Odyssey’s 2013 production resume includes the features “Drive Hard” (John Cusack & Thomas Jane), “Bad Karma” (Ray Liotta & Dominic Purcell), “Absolute Deception” (Cuba Gooding Jr. & Emmanuelle Vaugier) and “Way of the Wicked” (Christian Slater). This entry was posted in Cameron Bancroft, Lauren Holly, Lucie Guest, Valerie Harper and tagged 90210, America, Atlanta, Australia, BC, Beverly Hills, Brisbane, California, Cameron Bancroft, channel 188, channel 224, channel 338, Charter Communications, Comcast, composer, Cox Communications, Cuba Gooding Jr, David Winning, director, DIRECTV, DISH Network, editor, Emmanuelle Vaugier, entertainment industry, Facebook, family, international, Lauren Holly, Lesley Diana, Los Angeles, Lucie Guest, Michael Thomas, movie, network, Odyssey Media, original movie, photography, PR firm, premiere, press blogger, pro-social, publicist, romance, Ronda Rich, Sabrina Pitre, screenplay, Sheryl J. Anderson, television, The Promotion People, The Town That Came A-Courtin’, Time Warner Cable, Twitter, UP, Valerie Harper, Vancouver, Verizon FiOS on August 4, 2013 by press.